R30 F 42 292 Beam R.L. a.A. a.A.
R31 F 42 294 Brake Lever R.L. a.A. a.A.
R32 D 42 798 Bush, inside diameter:14,5mm a.A. a.A.
R33 F 42 295 Bearing pin R.L. a.A. a.A.
R37 F 42 298 Bolt R.L. a.A. a.A.
R38 F 42 299 R.L. 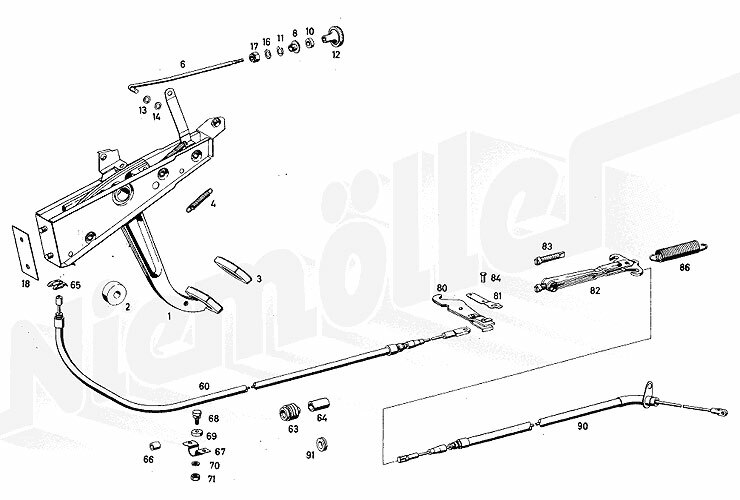 handle bar a.A. a.A.
R39 F 42 298 Bolt R.L. a.A. a.A.
R43 F 42 303 Holder R.L. a.A. a.A.
R44 F 42 305 Screw R.L. a.A. a.A.
R46 G 22 016 Screw,M.damper on engine mount a.A. a.A.
0 F 88 222 washer a.A. a.A.
R57 G 42 129 Hexagon socket screw 5x12 DIN 912 a.A. a.A.
R58 G 42 130 Spring washer, handle on handle bar a.A. a.A.